Keeping data in sync on your Mac with any devices you may have can be a real challenge. We don't just mean back it up on Mac OS X for further recovery, or transferring folders with files to your Mac, but a real sync with macOS applications like iCal, Address Book, iTunes and Photos. Since Sync Service was removed from OS X starting from version 10.9, there are not too many solutions that can sync data directly between Mac apps and devices offline, the majority of tools offer cloud sync. We rounded up top 7 Mac synchronization apps from Google search that position themselves as Mac OS X sync apps (online or offline). Enjoy! SyncMate is a rather handy and powerful tool that allows syncing data on your mscOS with numerous devices and online accounts. Supported devices. It supports sync with Android, iOS, other Mac computers, MTP and mounted devices. Online accounts supported are iCloud, Dropbox, Google. Moreover, you can sync data on Mac OS X with Windows services also - Outlook, Office 365 Home and Business accounts (sync with One Drive also supported). Sync options. The list of sync options is impressive as well. Starting from personal data to media files and folders. SyncMate offers several non-sync options like device mounting, SMS management and others. Conclusion. 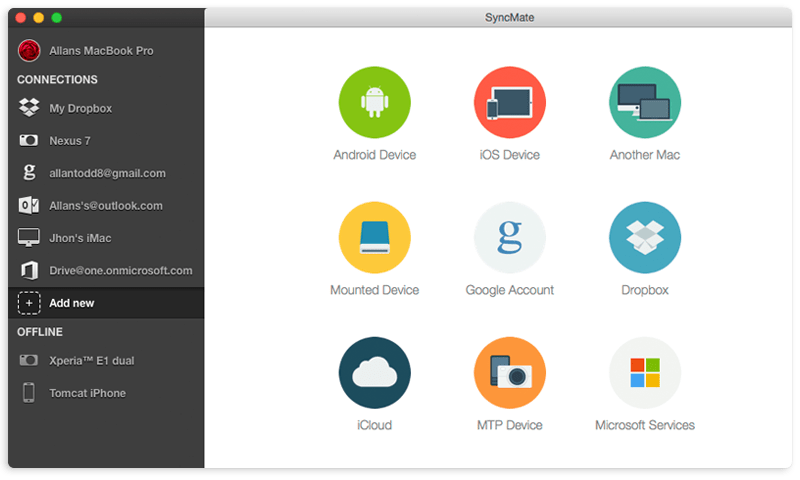 SyncMate is probably the most feature-rich featured app in this list and the only one that allows syncing data from numerous devices and accounts with Mac apps (iCal, Address Book, iTunes, etc.) directly without the necessity of using cloud sync. ChronoSync is a handy utility for not just syncing data, but backing it up and restoring as well. Supported devices. The list of supported devices is not really big. You can sync data between Mac computers and iOS devices only, syncing with other non-Apple devices or accounts is not offered. Sync options. 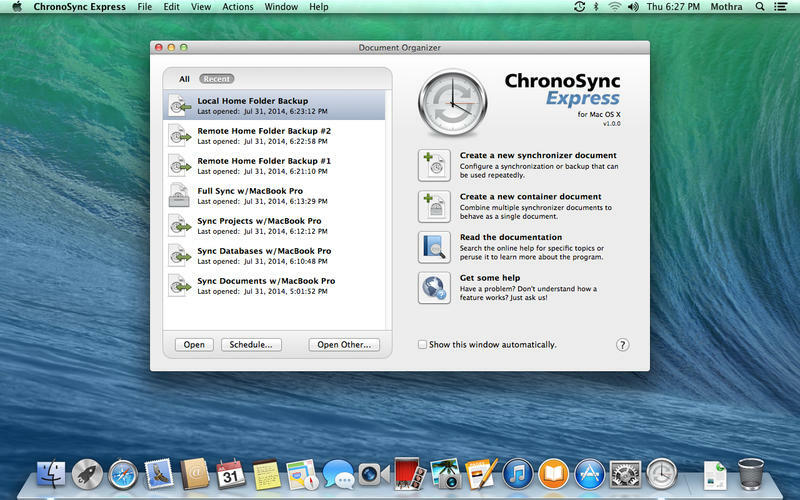 ChronoSync allows syncing any type of files between Apple devices, whether you need to sync media files or documents - ChronoSync can do this for you. ChronoSynс offers wide range of backup options - local backup, remote backup, bootable backup, remote bootable backup. Conclusion. Not a bad tool for files synchronization, but impossibility to sync personal data and support of Apple devices only (which in fact can be synced without any third-party apps) frustrates a little. Hope developers will expand the list of supported devices and sync options offered for them. Though Synchronize! PRO claims itself to be a sync tool, it is actually a backup/restore tool. Let’s take a closer look. Supported devices. Synchronize! PRO allows backing up data on Mac OS X to file server, or your PowerBook, or a FireWire disk, so that the files on both are up-to-date. You can even make a bootable backup to a disk image over a network. Sync options. In case of this app it would be more correct to name this section Backup options. There is a lot of them in fact. You can back up personal data as well as folders with files. Besides this Synchronize! Pro backs up your OS X startup disk to another hard disk, so that the backup disk is bootable. You can run your backups automatically and schedule them. Conclusion. Synchronize! PRO is a great app for data backup and restore, but if you are particularly looking for syncing, this app won’t help. 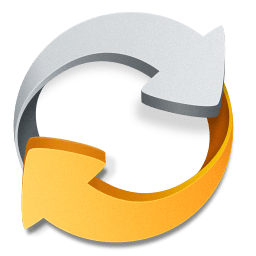 GoodSync is a nice piece of software that offers sync options as well as backup/restore. Supported devices. GoodSync automatically backs up and syncs files on your Mac OS X with any computer, drive or mobile device. With this app you can sync files between your computer, mobile devices, FTP, SFTP, Amazon S3, Google Drive, SkyDrive, WebDAV, Azure. You can back up data to portable drives, mobile devices and to FTP, S3, GDocs, SkyDrive, DAV or another computer. Sync options. GoodSync allows syncing folders with files between supported devices. Note that sync is performed only between pair of folders, not between folder and Mac app (iTunes, Photos). Conclusion. GoodSync offers a wide range of devices you can sync data on your Mac with, but the list of sync options is rather poor - no possibility to sync contacts, calendars; no interaction with built-in macOS apps. Here we’ve gathered together top 3 cloud sync services. The main advantage of these tools is that you can access data you are storing in the cloud from any device provided that this device is connected to Internet. Among the disadvantages is that not all of them offer interaction with Mac OS X apps or allow storing and syncing personal data like contacts and calendars. iCloud is a native cloud storage for Apple devices. The main advantage of iCloud is that you can not only store data in it, you can also manage personal data in iCal, Address Book, Reminders, etc. directly in iCloud account. Dropbox is probably the most popular and reliable cloud storage for now. It offers you cloud space for free and allows storing folders with any files there. You can not only store but also share data you have in Dropbox account. Available for macOS, PC, iOS and Android. Just like Dropbox, SugarSync provides you with a cloud storage where you can transfer files and folders. You can share the content you have stored in SugarSync storage; remove all synchronized files from a PC or Mac in the event of loss or theft. Available for Mac, PC, iOS and Android. How did we rate best apps to synchronize Mac? In order to objectively talk about macOS synchronization we need to start from the point that this is a limited OS in terms of connection and synchronizing with other devices. If you want to connect an macOS device with other devices from Apple, everything will go smooth, however, it’s a totally different story when trying the same thing with third-party devices. Several years back, Apple removed the built-in Sync Service which allowed data syncing between macOS and other devices. This means that some extra work had to be put in to compare the functionality of apps that allow Mac syncing. Key factors we considered while choosing best macOS synchronization software. Functionality. In order for an app to be worth mentioned and used it must support transfer and syncing for all data type. This includes folders, media, contacts and calendar notes. You wouldn’t want different apps to synchronize Mac data piece by piece, right? That’s why you need one app that can handle it all. Flexibility. You don’t have to be a tech genius to perform data transfer and sync, however, this operation is not at all an easy process. That’s why you need the best Mac OS X synchronization software to make the entire process smoother while allowing you to tweak a lot of things when it comes to data transfer. OS support. Since macOS is updated constantly, the app you buy for making the data transfer has to also withstand the latest version of macOS. App’s lifecycle. The one thing that makes a reliable Mac synchronization software the best one is constant improvement and updates. All possible support you get from the developer in the form of freshly updated version is a must for a good sync tool. Hope this list will help you choose the most appropriate sync solution according your sync needs. Thanks for reading!